QR Code is the name for Quick Response Code. Using QR codes is a rage in Japan. 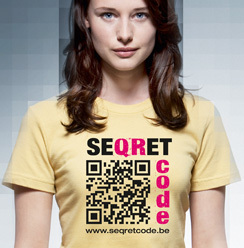 QR code embeds information in a Matrix barcode and there are simple software and online tools to generate a QR code. If you have a phone with camera,you can read a QR code. All you need to do is download a QR code reader. You can get QR readers from Getjar. Once you know how to Generate a QR code and read a QR code. You can go berserk with its uses like the one displayed here! Here is a good article to give you new ideas. Here are 101 ideas to use QR codes. Do not forget to generate Your Own Business-Card from this link. Click here for a Outlook 2010 Addin - QR codes for Outlook! Watch the Video for more clarity.